Oh, friends, the things I do for you! I do things like take this photo, for example, which involved me making a spectacle of myself in the middle of a public plaza for your enjoyment and for the enjoyment of quite a few Spanish observers as well. A few tourists even took my photo, so I may just show up in someone’s What I Saw in Madrid slide show back in Japan later this year. Hello, Japan! I am not a typical Madrileña, so don’t base your conclusions about our wonderful city on me. In any case, did you know yoga and sewing are very similar? 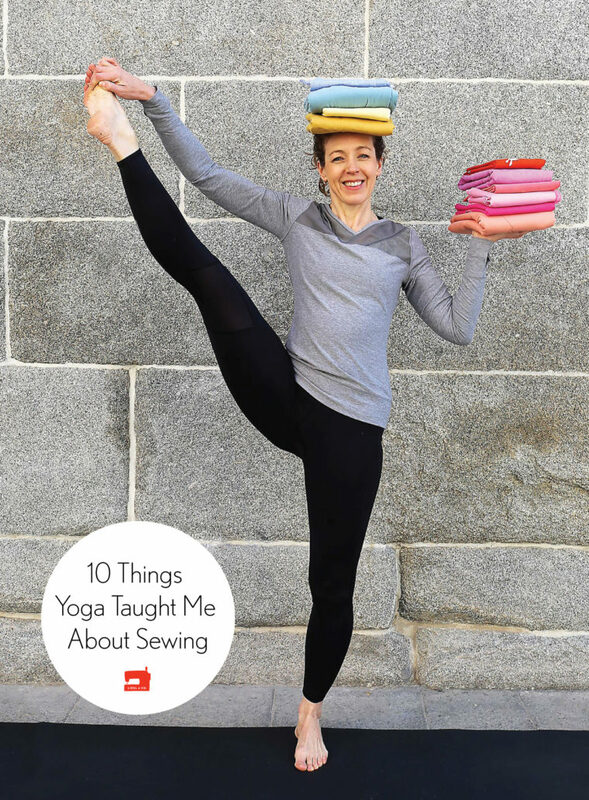 Here are 10 things I’ve noticed about yoga that relate to sewing. Practice, practice, practice! I’ve been doing yoga for about five years now, and although I don’t see much improvement or change from day to day or week to week, over a longer period of time I’ve noticed a gradual but very noticeable change. I’m much stronger and more flexible than I was before, and I’m gradually increasing my ability to do the tricky bits and movements I thought would never be possible when I started. (Handstands are still pretty far from my abilities, but I’m not giving up….) Sewing is the same; you may not notice a big improvement right away, but over time and with practice you’ll gain both skills and experience. Don’t be afraid to practice the parts that are most difficult for you! Make use of what you have. If you don’t stretch or strength train when you’re young, it will take more effort to recover those abilities when you’re older. Maybe it’s a strange comparison, but I would argue that your fabric stash is sort of the same. Use your fabric stash now rather than saving it for later. Your tastes might change over time (and fashions will definitely change), so you might as well enjoy what you have rather than saving it for someday in the future. Invest in yourself. I mostly do yoga at home, alone, but I still purchase (or sew!) good exercise equipment and gear. This helps me to enjoy the experience more, and I get a better workout when I’m dressed properly for yoga and I have the mat and props to help me work harder. Of course it’s the same with sewing. Purchase the best quality materials you can afford and your sewing experience will be more enjoyable. There is a huge difference between sewing good wool or cotton or lace and sewing the polyester “equivalents” of those fibers. Your enjoyment of the sewing process and of wearing the finished item will be vastly improved if you’re working with good materials. Which reminds me, work up to where you’re aiming! Before I tackle (someday) a full press-up handstand I’m obviously going to do the stretching and strengthening to prepare me for it. Do the same when you sew! Don’t cut into your expensive fabric until you’ve sewn a muslin to be sure the fit is good and you’re happy with the proportions. It doesn’t take a lot of time and it saves you the potential pain and frustration of going for it without the testing and practice beforehand. Give yourself extra incentive and learn from others. Join a group or take a class! This winter I lost my motivation to exercise, and next year I’ve realized that I’ll do better if I join a gym and force myself to get out of the house, especially when it’s cold and dark. If you feel like you’ve lost your drive or are feeling discouraged, go take a class or find a friend to sew with. You’re more likely to find inspiration to help you past that slump. The newest, most glittery, isn’t always the best. Fitness fads come and go, like fashion. Find what works for you and stick with it if it’s working. I’ve been doing mostly the same ashtanga level one yoga for the better part of my yoga practice. It’s what works for me, and I miss it when I try other yoga traditions and routines. Find your tied-and-true patterns, which will often outlast and give you better results than following the latest trend. Having said that, don’t be afraid to throw in a little something new once in a while. When I just can’t face another grueling ashtanga practice, I try a different yoga class or I mix things up with some running and high intensity interval training. Tired of sewing T-shirts? Try a different style, or move over to wovens for a while. You’ll expand your repertoire, and you might discover a style that you love. Or you might learn something new that gives you a better appreciation for your tried and true. Don’t take on too much at once. Go step by step. If you’re new to yoga you’re probably not going to be able to endure an entire class, let alone do the fancy poses and stretches. Same for sewing. Don’t attempt a wedding gown or a blazer if you haven’t tackled quite a few more basic styles first. Technique counts. You get a lot more from a yoga workout if your posture is correct, if you’re taking it slowly and working on the details. Same with sewing. Don’t rush through or get sloppy. It will show in your finished results and you’ll develop bad habits. Treat yourself once in a while! The fancy cork yoga blocks I purchased two years ago seemed like a big indulgence at the time, but I’m so grateful for them every time I use them. Don’t be afraid to spend a little on an extra tool or on the sewing machine with features you know you’ll use if you can afford it. You’ll make your sewing experience more enjoyable and you might find that your skills and results are improved as well. See? Yoga and sewing–not that different from each other in many ways. I agree completely! You chose very accurate and sage words here. I can relate on many levels. Now I want to get back to doing yoga again (I like ashtanga too.). Thank you. Oh, I hope you do! I feel so much better when I exercise on a regular basis, and yoga keeps me flexible and strong. So true! I find yoga and sewing both very meditative too. Sometimes I like to sew or practice yoga to music but often I choose silence. I have a friend who shares her yoga practice with her children. I share my sewing with my two boys. We’ve talked about our similar approach. I loved reading your post, thank you. I like silence too! You are much more patient than I am to cook or do yoga with kids! Very good comment. I think I should go back to yoga giving myself a time for it. Liesl, What a wonderful comparison. This made me smile! Can you share the yoga site that you use? Thank you.